Nyrius LT12 12 Language Global Digital Talking Translator Foreign Pocket-Sized E. Shipped with USPS Priority Mail.Very gently used. Includes everything that came with it originally except the extra batteries - it does come with one set of batteries. The translator uses two each CR2032 batteries. We bought this a few years back for an international trip - - we have recently tested it with the batteries to make sure it works. Thanks for looking. Fully tested, in good shape . Minor wear above upper buttons, but doesn't obstruct view. I have an extra battery for it. 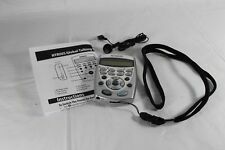 Nyrius Global Talking Translator LT12 Foreign Languages Handheld + 12 Batteries! Handheld electronic translators are the modern answer to paper dictionaries. Cross-translate 12 international languages using any of the 8400 built-in phrases. The box has been opened and shows signs of wear and the device has a couple of superficial scratches and one small scuff at the top left corner. 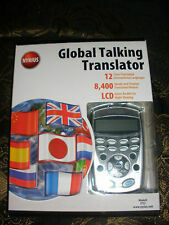 5 out of 5 stars - Nyrius Global Talking Translator LT12 Foreign Languages Handheld + 12 Batteries! 1 product rating1 product ratings - Nyrius Global Talking Translator LT12 Foreign Languages Handheld + 12 Batteries!